Going through a divorce can be life-changing. Apart from dealing with emotional stress, you and your spouse also need to make decisions on various issues, such as child custody and division of marital property. Hiring an experienced and certified mediator can help you with divorce mediation in Wake Forest. For divorce mediation in Wake Forest, turn to Eatmon Law Firm. Our law firm offers various legal services, including divorce mediation in Wake Forest. Family law is our main area of practice. We handle cases involving absolute divorce, adoption, property division, child custody, as well as child and spousal support. We serve clients in Wake, Durham, Franklin, and Granville Counties. 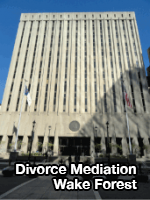 What Is Divorce Mediation in Wake Forest? Divorce mediation in Wake Forest involves the two divorcing parties talking about their future. During this process, they will work through issues arising from their divorce, such as child custody and support as well as property distribution. A mediator can be an attorney, licensed mediator, or another type of legal professional. He or she serves as the neutral third party during divorce mediation in Wake Forest. The mediator will act as a facilitator, making sure communications between the divorcing parties are clear, open, and abide the law. During divorce mediation in Wake Forest, a mediator may help a divorcing couple find common ground and brainstorm ideas that will lead to long-term agreements. Additionally, during divorce mediation in Wake Forest, the mediator helps the two parties negotiate the terms of their divorce. Being a go-between for two people with opposing views makes divorce mediation in Wake Forest challenging. That is why a mediator, by law, must be objective in divorce mediation in Wake Forest. He or she will focus on both parties’ interests and needs. If the divorcing couple has children, custody is one of the primary issues to be discussed during divorce mediation in Wake Forest. A divorce attorney must prioritize the children’s welfare in divorce mediation in Wake Forest and discuss how the pending divorce may affect them. He or she should also intervene in case a spouse is not thinking about the welfare of the children. Consider hiring an attorney who has years of experience in family law as well as divorce mediation in Wake Forest. A seasoned attorney has handled various legal cases as well as divorce mediation. Wake Forest residents can count on him or her to simplify the complex and tedious divorce process. A divorce attorney may be handling several cases apart from divorce mediation in Wake Forest. However, he or she must still be available to clients who need divorce mediation. Wake Forest residents should hire attorneys who respond promptly to their concerns. During your first meeting with an attorney, observe whether he or she listens intently when you discuss your concerns. You are about to share personal details which your closest friends may not even know about. He or she should be considerate of your family’s overall welfare. Turn to Eatmon Law Firm for assistance with divorce mediation in Wake Forest. Our practice areas include alternative dispute resolution, such as divorce mediation in Wake Forest. Contact us at (919) 435-0565 to learn more about our other services. You may also reach out to us by filling out the form on our website. At Eatmon Law Firm Office, we commit ourselves to providing our clients with compelling and practical legal advice. We will work hard to help you achieve the best possible outcome for your situation. If you are interested in obtaining our services, reach out to us. To schedule your initial consultation, give us a call at 919-435-0565. We look forward to working with you.